We know your holiday shopping list probably doesn’t include dental implants. But if you’re missing one or more teeth, there’s never been a better time to consider implant dentistry. It’s the only truly comprehensive tooth replacement available — and you deserve the best around the holidays (and all year long!). But the best news? You can find comprehensive care for dental implants in Littleton, CO at Blue Sage Dental. 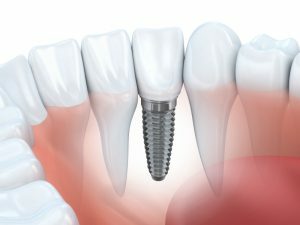 Think of a dental implant as a miniature screw. Small, sturdy, and made of titanium, it acts as a prosthetic root to support a replacement tooth. The dental implant so closely mimics the structure of the natural tooth that it is sometimes called nature’s rival. Dental implants are completed in two phases: implantation and restoration. Most dentists can perform the last half of the treatment, but will refer you out of the office for the initial implantation. But Dr. Kutis is highly trained and experienced in both phases of implant dentistry. That means you work with her through every step of the dental implant treatment — no need for outside referrals or getting to know another dental team. What’s the Procedure Like for Dental Implants? After Dr. Kutis has confirmed that you are a good candidate for dental implants, your treatment plan is put in place. Patients should be in good oral and overall health to undergo the procedure for traditional dental implants. A bone augmentation procedure may be necessary to increase the volume of the jaw bone for successful anchoring of the dental implants. Each dental implant is placed beneath the gum line in the space left behind by the missing tooth’s root. Here, it heals together with the jawbone over a period of four to eight months in a process known as osseointegration. After the bone has grown around the implant, restoration can begin. To complete the procedure, the dental implant is exposed and a connecting abutment is placed on top. After one more brief healing period, the prosthetic tooth is securely affixed onto the connecting abutment. In eligible candidates, dental implants have a success rate of more than 95 percent. Occasionally, dental implants fail as a result of poor dental hygiene or poor oral or overall health. Make sure you brush, floss, and visit your dentist regularly to enjoy your dental implants for a lifetime to come. If you notice an implant becoming loose or sore, contact your dentist immediately. Treat Yourself to Dental Implants! Don’t leave dental implants off the holiday list this year. Tooth replacement can’t wait — your jawbone will slowly lose its shape without a sturdy solution. Request an appointment at Blue Sage Dental today!